If you are worried about the types of floods that may occur in your area and need advice on how to prepare for them, contact the Environment Agency (EA) or the Scottish Environment Protection Agency (SEPA) on their shared Floodline - 0845 988 1188. Both the EA website and the SEPA website allow you to assess flood risk by postcode and contain wide-ranging advice. The EA website includes sections for families, older people and businesses. Please note that in many cases the advice has legal implications (see the section on your rights and duties). Heavy storms or other extreme weather conditions combined with high tides can cause sea levels to rise above normal, force sea water to the land and cause coastal flooding. Proper flood defences need to be in place to safeguard life and property. The Environment Agency and SEPA constantly monitor sea levels and release flood warnings when required. This type of flooding, where a river bursts or overtops its banks and floods the areas around it, is more common than coastal flooding in the UK. River flooding is generally caused by prolonged, extensive rain. Flooding can be worsened by melting snow. Flooding can also occur if the free flow of a river gets blocked by fallen trees, natural overgrowth or rubbish. People who own land around rivers (riparian owners) in England have a legal duty to prevent flooding by making sure that they avoid blocking the free flow of the river. 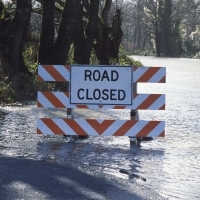 A flash flood is a fast-moving and unexpected flood. Flash flooding is usually due to heavy rain. While natural events may be responsible for most flash flooding, it may also arise if flood defences fail or drainage systems are insufficient. It is expected that flash flooding may become more frequent due to climate change and over-development in flood plains. Groundwater flooding can occur when water levels underneath the ground rise above normal levels approaching the surface. It is usually caused by prolonged periods of rainfall. Groundwater flooding can last for weeks and months. The UK Groundwater Forum estimates that groundwater flooding affects several hundred thousand properties in the UK. It differs from surface water flooding which is caused when heavy rain directly hits the ground surface. Sewer flooding may result from a failure of the sewerage system. It may also happen when the sewer system does not have enough capacity to take water entering the system from heavy rainfall or river or highway flooding. Sewage water flowing into a building is classified as internal flooding. When it floods a garden or other open space such as roads or public grounds it is considered as external flooding. If sewage flooding on your property is caused by a fault in your private drainage, you are responsible for sorting out the problem. In England, sewerage undertakers now have responsibility for some private sewers (as opposed to private drains – the distinction being that sewers drain more than one property). If the flooding is due to a fault in the public sewerage system, your local sewerage provider is responsible for fixing it. In England, your local council will normally be responsible for drains and sewers around council homes while the EA would sort out any problem arising from river and coastal floods. Unitary authorities and county councils are responsible for highway drainage. In Scotland, Scottish Water manages the public water and sewerage network, which includes assessing the risk of surface and sewer flooding. The Highways Agency is responsible for maintaining the main road networks in England. Transport Scotland is responsible for motorways and trunk roads in Scotland. The Welsh Government manages motorways and trunk roads in Wales.